Photo: ZID Theater in Holstebro with Eugenio Barba. 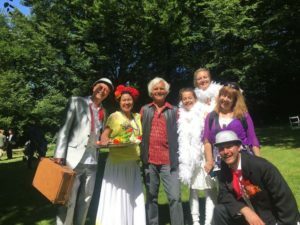 In June, we took ZID Theater to the small town of Holstebro in Denmark (population 50,000) to take part in the Festuge Festival. It is organised every three years by ODIN Teatret, an international theatre company that has been based here for 50 years. 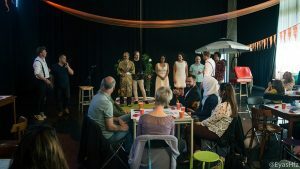 This year the festival had its 10th anniversary and took place within the large-scale European Social Community Theatre project, Caravan Next (www.caravanext.eu) in which ZID participates. I myself have participated in several editions of Festuge, but each time again I let myself be surprised. It is a festival for and by the people of the town and the surrounding villages, artistically ‘translated’ and designed by the makers of ODIN and many international guests. Every time again they manage to transform the town and its surroundings into a world stage in a special way. As we were going to perform at different locations, we selected three performances, each one suited to the theme of that day’s event. Actor and theatre maker Sebo, our daughter Lara—who performs in almost all our productions—dancer Joske, actress Claribel and theatre maker Daan together made up ZID’s cast for this festival. In the centre of town was a floating raft, a stage that had been named ‘Wild Island’. Here, an hour-long crossover programme was presented every day by various international companies together with local art associations. Rain or shine, the performances always continued before an audience of a few hundred people sitting on the steps. On the raft we performed an edited version of our production Love Now, which fitted well within the setting of strong wind, water and the red background. Our next performance was during the grand parade of a hundred makers going through the town, presenting their creations along the way. We played with the concept of Colour me Red , creating an urban painting. The colour of the shipyard and the movements of the performers made for some surprising effects. Finally, on the last day of the festival, during the closing on-site performance in the large municipal park, we were at a beautiful spot among the trees with our performance Inside/Outside. Holstebro Festuge’s theme was Wild West. There were many references to the wilderness of Jutland and to the ‘wild spirit’ of artists, who can take urban space and the people on a special journey through the changing or changed city. Théâtre du Centaure from Marseille, with its marvellous horses and actors performing as one in a fascinating way, were the main guests of the festival. They rode across the town square, along the seaside, through the streets, inside the library among the books, and even in the church. Not a day went by without meeting a horse or seeing one in one of the many performances. The company had linked up with local riders and clubs, so the horses were spotted everywhere, playing a part in almost all events. How can theatre transform a community? We saw entire villages perform, men and women in traditional costumes dancing the tango, local brass bands playing Italian opera music, children swimming or riding all kinds of farm vehicles, bicycles, skates. In the concluding performance the students of a classical ballet school performed in the park with a Kathakali dancer. For 11 days, the programme was one continuous flow. It started early in the morning at the train station where people left for work and continued until well into the night in the church at the town square. Performances, acts, video installations, music and, always, the horses. The whole town looked more like one huge Fellini film set where something unexpected could happen at any time. Even the residents who were not involved became co-actors in this atmosphere of a continuous performance. So yes, surroundings and the town itself can be transformed, if only the administrators and politicians embrace art as a driving force. Holstebro presents a unique example, with its mayor, an enthusiastic supporter of the Festuge Festival, personally present on many occasions. He gave permission to transform the town into a stage where the rules of theatre held sway for 11 days. And that means: celebrating a feast of art and togetherness that enriches our lives. 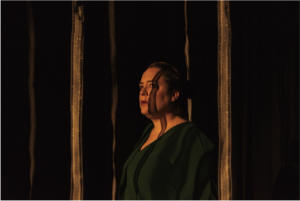 Over the course of its 50 years in Holstebro, ODIN Teatret, which also tours all over the world every year, has brought the world and artists from all continents to the town to bring the unknown closer. That is the role of art today: to arrange, more than ever, the meeting of various worlds that are unknown to each other. If you want to know more about ZID in Holstebro? 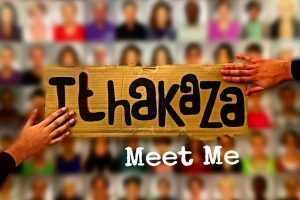 See the travelog of Lara Bakker. Lara made a short videoreport of our tour to Holstebro in Denmark.